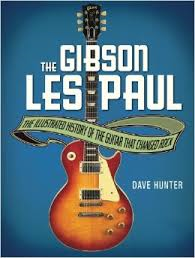 The Gibson Les Paul by Dave Hunter is a 2014 Voyaguer Press/ Backbeat Books publication. I was provided a copy of this book by the publisher and Edelweiss in exchange for an honest review. This short illustrated book tells a brief history of Les Paul. Many are not aware that Les Paul had a career as a musician in his own right. So it was only fitting that the book started with a little background on Paul's career and life. At this point we enter into an illustrated list of various rock performers that have used a Les Paul guitar. Joe Walsh, Eric Clapton, blues performer Freddie King, among many other greats. This section shows color photos of the artist with the guitar and some interesting album covers, along with a brief bio of the artist and what music they are known for and the Les Paul they first used or the one they use most etc. The third section of the book deals with the making of the guitars. There are also color illustrations in this section. I do wish Les Paul's history had been a little more in depth. His name is part of what this book is about so a little more history would have been nice. The second section will be the most popular one for readers since we recognize most of these names and it's interesting to see why so many of these musicians chose Les Paul guitars. Classic rock groups and artist from the seventies and eighties are the ones featured the most in this section. For me, the last section was the most interesting. I don't know a great deal about what goes into the making of a guitar so I learned something I didn't know before. If I could make a suggestion it would have been to switch the order around and give us the history, the making of the Les Paul guitar and then add the musicians section at the end. This book will appeal to fans of the Les Paul Gibson guitar . Those who like to know what guitar their favorite rock legend choses and why will enjoy the book too. This would make a nice edition for anyone that plays the instrument or is a collector. Overall this is fun and informative book . I give it a or 3.5 stars rounded to 4.